History can also refer to the academic discipline which uses a narrative to examine and analyse a sequence of past events, and objectively determine the patterns of cause and effect that determine them. Historians sometimes debate the nature of history and its usefulness by discussing the study of the discipline as an end in itself and as a way of providing "perspective" on the problems of the present. Stories common to a particular culture, but not supported by external sources (such as the tales surrounding King Arthur), are usually classified as cultural heritage or legends, because they do not show the "disinterested investigation" required of the discipline of history. Herodotus, a 5th-century BC Greek historian is considered within the Western tradition to be the "father of history", and, along with his contemporary Thucydides, helped form the foundations for the modern study of human history. Their works continue to be read today, and the gap between the culture-focused Herodotus and the military-focused Thucydides remains a point of contention or approach in modern historical writing. In East Asia, a state chronicle, the Spring and Autumn Annals was known to be compiled from as early as 722 BC although only 2nd-century BC texts have survived. The Second Crusade (1145–1149) was the second major crusade launched from Europe. The Second Crusade was started in response to the fall of the County of Edessa the previous year to the forces of Zengi. The county had been founded during the First Crusade (1096–1099) by Baldwin of Boulogne in 1098. While it was the first Crusader state to be founded, it was also the first to fall. The Second Crusade was announced by Pope Eugene III, and was the first of the crusades to be led by European kings, namely Louis VII of France and Conrad III of Germany, with help from a number of other European nobles. The armies of the two kings marched separately across Europe. After crossing Byzantine territory into Anatolia, both armies were separately defeated by the Seljuq Turks. The main Western Christian source, Odo of Deuil, and Syriac Christian sources claim that the Byzantine emperor Manuel I Comnenus secretly hindered the crusaders' progress, particularly in Anatolia where he is alleged to have deliberately ordered Turks to attack them. Louis and Conrad and the remnants of their armies reached Jerusalem and, in 1148, participated in an ill-advised attack on Damascus. The crusade in the east was a failure for the crusaders and a great victory for the Muslims. It would ultimately have a key influence on the fall of Jerusalem and give rise to the Third Crusade at the end of the 12th century. The only success of the Second Crusade came to a combined force of 13,000 Flemish, Frisian, Norman, English, Scottish, and German crusaders in 1147. Travelling from England, by ship, to the Holy Land, the army stopped and helped the smaller (7,000) Portuguese army in the capture of Lisbon, expelling its Moorish occupants. 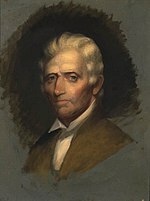 Daniel Boone (November 2, 1734 [O.S. October 22] – September 26, 1820) was an American pioneer, explorer, and frontiersman whose frontier exploits made him one of the first folk heroes of the United States. Boone is most famous for his exploration and settlement of what is now the Commonwealth of Kentucky, which was then beyond the western borders of the settled part of the Thirteen Colonies. This region legally belonged to both the Commonwealth of Virginia and to the American Indian Tribes at the time. Despite some resistance from American Indian tribes such as the Shawnee, in 1775 Boone blazed his Wilderness Road through the Cumberland Gap in the Appalachian Mountains from North Carolina and Tennessee into Kentucky. There he founded the village of Boonesborough, Kentucky, one of the first English-speaking settlements west of the Appalachians. Before the end of the 18th century, more than 200,000 European people migrated to Kentucky/Virginia by following the route marked by Boone. Boone was a militia officer during the Revolutionary War (1775–82), which in Kentucky was fought primarily between the European settlers and the British-aided Native Americans. Boone was captured by Shawnee warriors in 1778, who after a while adopted him into their tribe. Later, he left the Indians and returned to Boonesborough to help defend the European settlements in Kentucky/Virginia. Boone was elected to the first of his three terms in the Virginia General Assembly during the Revolutionary War, and fought in the Battle of Blue Licks in 1782. Blue Lick was one of the last battles of the Revolutionary War, coming after Lord Cornwallis surrendered to Washington in October of 1781. ... that the anti-religious campaign culminating in the Stalinist show trial of the Kraków Curia (pictured) led to the imprisonment of 123 Polish Roman Catholic priests in just one year? ... that Confederate brigadier general Alfred E. Jackson was pardoned by President Andrew Johnson because of his kindness toward Johnson's family during the Civil War? ... that after HMS Porcupine was nearly split in two by a torpedo, the halves were nicknamed HMS Pork and HMS Pine? ... that the Experiment was a boat powered by horses running on a treadmill and propelled by a then-novel type of screw propeller? ... that one of the highest-ranking generals in China was injured in battle nine times? ... that in Mesopotamian mythology, the Apkallu were sent by the god Enki, from Dilmun to teach human beings various aspects of civilization? ... that Karl Marx's theory of historical trajectory attempted to prove the long-term unsustainability of capitalism? ... that in November 1921, the schooner Cymric collided with a tram in Dublin? Temple Square is a complex owned by The Church of Jesus Christ of Latter-day Saints and located in the centre of Salt Lake City, Utah. This historic photochrom shows the Salt Lake Temple, Salt Lake Tabernacle and Salt Lake Assembly Hall and is dated approx 1898–1905. 1782 – The States General of the Dutch Republic received John Adams, and the house he had purchased in The Hague became the first United States embassy. 1809 – War of the Fifth Coalition: The French won a hard-fought victory over Austria in Lower Bavaria when their opponents withdrew from the field of battle that evening. 1956 – Actress Grace Kelly (pictured) became Princess consort of Monaco upon marrying Rainier III, Prince of Monaco. 1971 – The first space station, Salyut 1, was launched from the Baikonur Cosmodrome near Tyuratam, Kazakh SSR, USSR. 2015 – In Baltimore, Maryland, U.S., Freddie Gray died of injuries sustained a week earlier while in the custody of the Baltimore Police Department. "No victory of arms, or tyranny of alien finance, can long suppress a nation so rich in resources and vitality. The invader will lose funds or patience before the loins of China will lose virility; within a century China will have absorbed and civilized her conquerors, and will have learned all the technique of what transiently bears the name of modern industry..."
Are you a historian, i.e. one who studies and writes history, and who has a keen interest in writing outstanding articles? Join our fine group by adding Category:Wikipedian historians to the bottom of your user page.